May a lawyer ethically send the lawyer’s client a blind copy of an email to opposing counsel where opposing counsel has objected to such practice? That is a question recently addressed by the New York State Bar Association Committee on Professional Ethics. See N.Y. Bar Assoc. Op. 1076 (Dec. 8, 2015). The answer: Yes. Of course a lawyer can “bcc” the lawyer’s client. While a lawyer owes duties of loyalty and confidentiality to the lawyer’s client, the lawyer owes no such duties to opposing counsel. Therefore, a lawyer does not need the “consent” of opposing counsel to send the lawyer’s client copies of email communications. On the contrary, “[s]ince a lawyer is an agent of the lawyer’s client, opposing counsel should expect that the lawyer may share correspondence relating to the representation with the client.” Moreover, opposing counsel should know that the lawyer has an obligation under Rule 1.4 to keep the client reasonably informed about the status of the client’s matter. For these reasons, it is not a “false, misleading, or deceptive” practice for a lawyer to “bcc” the lawyer’s client on correspondence with opposing counsel. 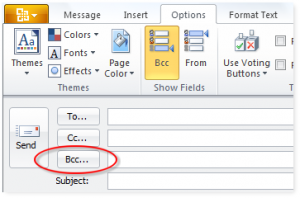 However, using the “bcc” address field potentially “raises other problems if the client mistakenly responds to the e-mail by hitting ‘reply all.’ For example, if the inquirer and opposing counsel are communicating about a possible settlement of litigation, the inquirer bccs his or her client, and the client hits ‘reply all’ when commenting on the proposal, the client may inadvertently disclose to opposing counsel confidential information otherwise protected by Rule 1.6.” For this reason, the opinion advises that a lawyer should forward email correspondence to a client rather than using the “bcc” field.